1 of 3 Prepare your grill for direct and indirect heat by building a fire (wood or a combination of charcoal and wood) on one side of the grill, leaving the other side empty. 2 of 3 Place pork loin on a cutting board or platter and brush all over with oil. In a small bowl, stir together dry rub seasonings. Apply dry rub to meat evenly, patting so rub adheres. 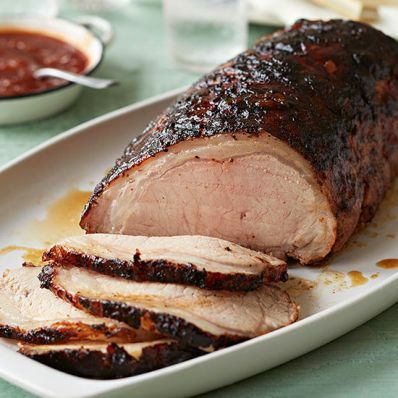 3 of 3 When cooker reaches 400 degrees , place pork loin directly over medium-hot coals. Cook for 10 minutes on each side to brown. Move pork away from heat, cover grill and cook for 70 to 90 minutes or until porks internal temperature reaches 150 degrees . Baste with Apple Bourbon Barbecue Sauce during last 10 minutes of cooking. Let pork loin rest on a cutting board under tented foil for 10 minutes before slicing. Per Serving: 4 g sat. fat, 22 g carb., 1 g fiber, 38 g pro., 734 mg sodium, 11 g Fat, total, 97 mg chol., 344 kcal cal.